Low Impact Transportation: This trip gives you the chance to try out the public buses and four-wheel-drive vehicles. Sometimes local transport is the best and most colorful way to go around around as the locals do not only allows you to experience the culture on a deeper level, but the same way it is at home, using public transport is the most sustainable way to go – after walking and cycling of course! 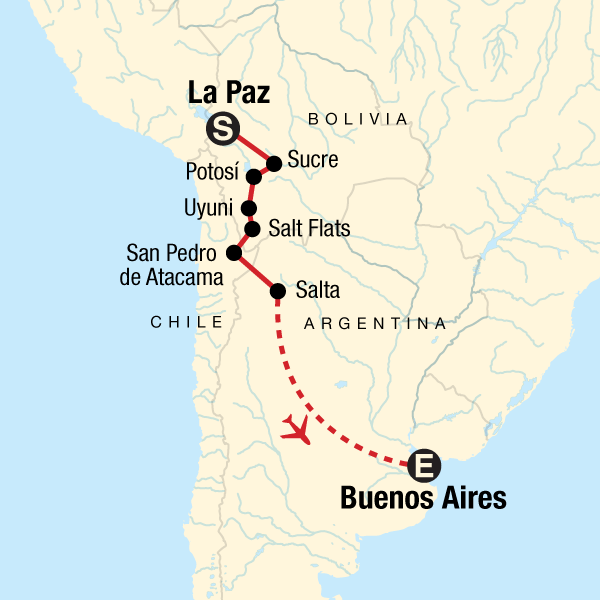 - Local buses: from La Paz to Potosí, Potosí to Uyuni (Bolivia), San Pedro de Atacama (Chile) to Salta (Argentina). Four-wheel-drive vehicles in a 3 day dessert crossing surround by stunning out-of-this-world landscapes excursion where no other kind of transportation is possible because of the isolation and challenging climate. - World Heritage: Potosí is the highest city of its size in the world, this UNESCO World Heritage Site has had a tumultuous history as a silver mining centre during colonial times. It’s possible to take an option to descend into a working mine for a close-up look at methods basically unchanged in decades, if not centuries, a great opportunity to interact with the locals aswell as learning about life in the mines and better chance understand the Andean religion, believes and traditions. During the dessert crossing excursion we will travel trough the biggest conservation site in Potosí department: The Reserva Nacional de Fauna Andina Eduardo Avaroa (Bolivia). This reserve aims to improve current management practices to more sustainable practice patterns ensuring the availability of resources in the long term, works to develop strategies for sustainable management and tourism, develop monitoring and research that support the activities of conservation, sustainable use and ecotourism. Also in this specific reserve we can find the largest one of the largest flamingos communities and vicuñas austral communities of South America. Valle de La Luna (San Pedro de Atacama, Chile): during this trip is possible to visit the most important geological landscape of the Cordillera de la Sal or the Salt Mountain Range characterize by its stunning natural formations, it presents an extraordinary attractive by its similarity with the moon surface and the natural coliseum of great dimensions. Currently the park "Valley of the Moon" is managed by a local atacameña community and is considered protected Natural Park. Supporting local culture and businesses: There are a multitude of opportunities to support local businesses and immerse yourself in South American culture on this trip. From the colorful markets to locally-owned restaurants and food stalls, the choices for eating and handicrafts are endless and the money is staying in the local economy. - Activities that take you to memorable places like: La Paz renowned local markets (amazing for local handycrafts at great prices) and the unique Mercado de las Brujas (Witches’ Market) where Paceños and visitors may purchase potions and incantations made from all sorts of herbs, seeds, and secret ingredients to remedy any number of illnesses and protect from evil spirits. Colchani’s handycrafts market where you can find objects made with pure salt extracted from the salt flats (main source for local economy) and locally-owned accommodations like the salt hotels (yes, with salt walls, salt floors, salt tables, salt chairs and salt beds) we used during the dry season or the simple family-own shelters use during the wet season while the excursion trough the Altiplano dessert. Our style of trip, travelling, eating and staying with the locals, puts you right at the heart south american culture. South America’s countries are very different and the societies very diverse from the conservative Andean towns to the European style vibrant cities in the Atlantic coast. A number of journeys on this tour use public transport, the hotels are small, individual properties often run by the owners and their families, we eat in local restaurants serving locally grown produce – our style of travel ensures that as many local people as possible benefit by our being there. This tour runs with a maximum of 16 people which helps to minimise the impact on delicate environments. - The 3 day excursion spend in the stunning landscapes between the Salar de Uyuni (Bolivia) and the Atacama Desert (Chile) gives the possibility of a great interaction with the locals. We travel across the dessert in small groups, using local transportation and staying in locally-owned hotels, we work with experienced local guides who are knowledgeable of local culture, history, flora and fauna, we hire local drivers and cooks from the surrounding villages. - Visit the Buenos Aires Community Action Center: the project is held in La Boca neighborhood, one the cities most famous areas because of the touristic attractions but with high rate of poverty and crime; many creative initiatives to provide opportunities and fulfill basic needs to community members. Their daily meal program serves 80 children, youth and adults a warm meal, cooked up by volunteers who also benefit from the community centre's programs. Other programs include computer skills training, a library, art lessons, self defense classes, community radio, and cooperative businesses that provide job opportunities such as a bakery, sewing cooperative, and a youth laundry that serves the city's hostels.